Yaya Dub had indeed taken the hearts of many Filipinos by storm as she continues her love story with Alden Richards in the noontime variety show Eat Bulaga, however, even her sister is now taking a share in the limelight as fans also take notice of her beauty. 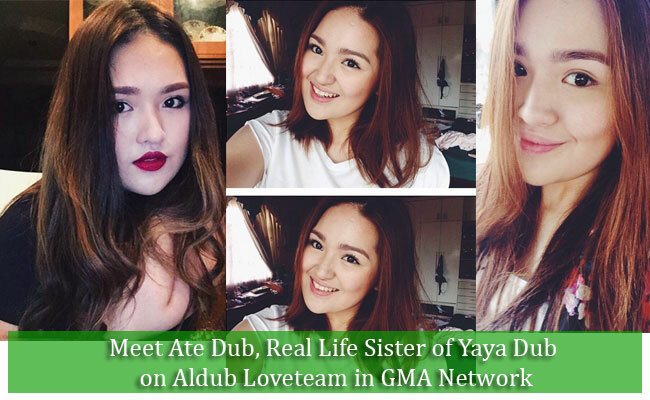 Yaya Dub’s sister is now becoming known as ‘Ate Dub’. Like Nicomaine Dei Mendoza, known as Yaya Dub, her sister Nicoleen Dyann Mendoza is catching the eyes of many netizens with her looks and own beauty. Coleen is the fourth among the five siblings and Maine is the youngest. With the sudden found fame of Maine as Yaya Dub, the Mendoza family of Sta. Maria, Bulacan still decided to live a simple life and away from the limelight, however, the AlDub fans seemed to be addicted on finding anything connected with their idol Yaya Dub. Coleen is an BS Accountancy graduate and currently works in a private company. Many netizens appreciated her beauty and said that she also has a different kind of charm compared with Yaya Dub. Despite the fame and busyness in her career, Maine is said to still find time to bond with her family and her sister. Nicomaine Mendoza first got into the netizens’ radar after she posted a series of DubSmash videos impersonating Kris Aquino and other celebrities. The 20 year old actress was waiting to land a job as a flight attendant and had too much time in her hands while working in her family’s business office so she was able to create a lot of videos. She was known as DubSmash Queen until GMA network took her as part of the Eat Bulaga where she became Yaya Dub in the segment Juan for All, All for Juan. The staff discovered she had a real life crush on Alden Richards and the rest is history.